Chocolate makes everything seem a little decadent & life a little better. 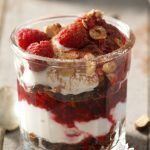 When it’s added to granola with hazelnuts, layered with raspberry compote & Greek yogurt, now you’ve got my attention: breakfast is worth the early morning alarm & the blurry eyes. Losing weight & vowing to eat only wholesome, fresh food doesn’t mean deprivation. At least not to this girl. I’ve tried that & failed. I offer no excuses when I say I need to look forward to my meals. Not dread them. That mentality sets me up for failure. I know I’m not alone in this mindset. Homemade granola is infinitely better than any store-bought granola I’ve ever eaten. Homemade granola is a cinch to make & the ingredients are easy to switch out – maple syrup for the honey, making it vegan if you’re into that, or switch out any of the nuts. Maybe add some coconut – so good with chocolate. For the compote (fancy term for fruit cooked in sugar, or in this case – honey) I use frozen berries to create the sauce. Fresh berries don’t give you the sauciness that frozen berries do & we all need a little extra sauciness in our lives. Once everything is cooled all that’s left is some quick assembly in the form of layering the granola with the compote & creamy Greek-style yogurt. Or, if you’re impatient like me, you’ll make yourself just a wee bowl to sample while everything is still warm. I have no patience & little self control, choosing to wait until the next morning would have proved futile. Place hazelnuts on one baking sheet. Roast for 10 to 12 minutes or until golden brown; let cool 5 minutes. 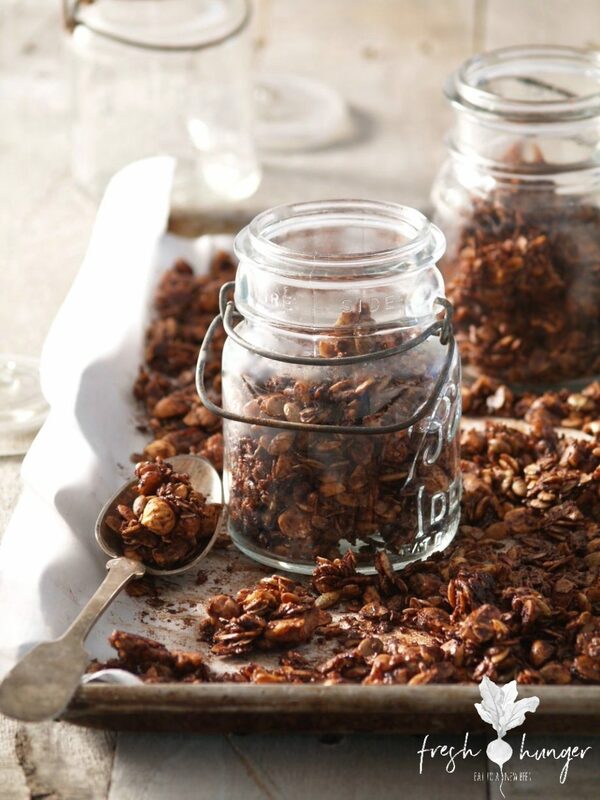 Transfer hazelnuts to a clean tea towel, reserving baking sheet for granola. Fold tea towel over hazelnuts & rub back & forth to remove their skins. Remove hazelnuts from towel & coarsely chop. Combine honey, oil, cacao powder, nutmeg & salt in a large bowl. Add hazelnuts (reserving a few for garnish), oats, walnuts, pepitas & almonds. Mix well until everything is coated in honey mixture. Spread mixture evenly onto 2 baking sheets. Bake for about 35 minutes, stirring twice during cooking, or until mixture is browned & smells nutty & cooked. Cool completely on baking sheets. The mixture will harden as it cools & form some larger pieces. Store in airtight jars. Makes about 8 cups or 24 servings. I keep half of my granola in the freezer to ensure freshness. 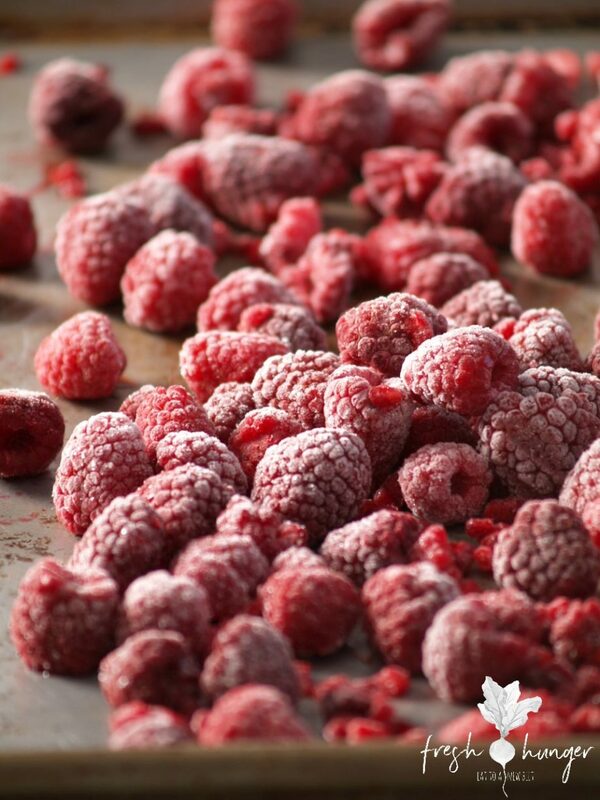 To make the compote: Heat the raspberries & honey in a small saucepan over medium heat until raspberries are thawed. Simmer, uncovered, for 3 to 5 minutes or until raspberries are broken down & sauce-like. Spoon into a jar & chill at least 2 hours until cold. 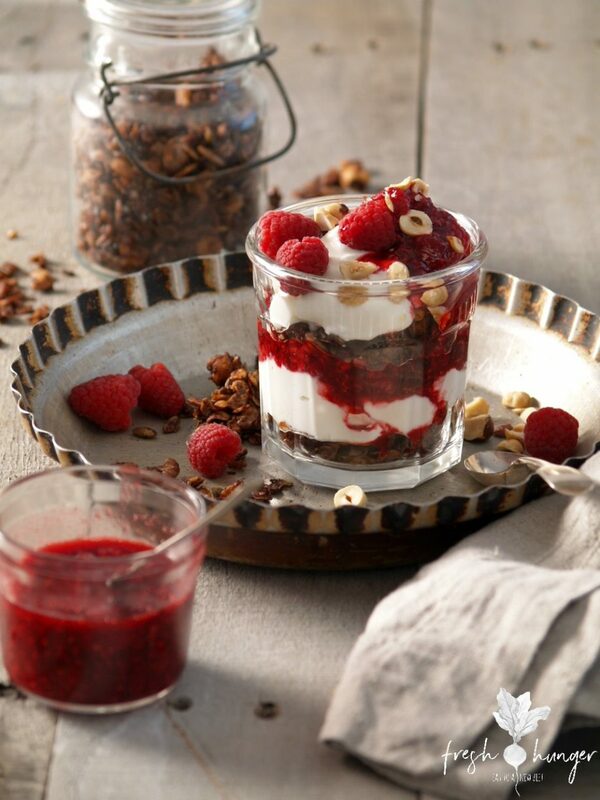 To serve: Layer granola, raspberry compote & yogurt into serving glasses. 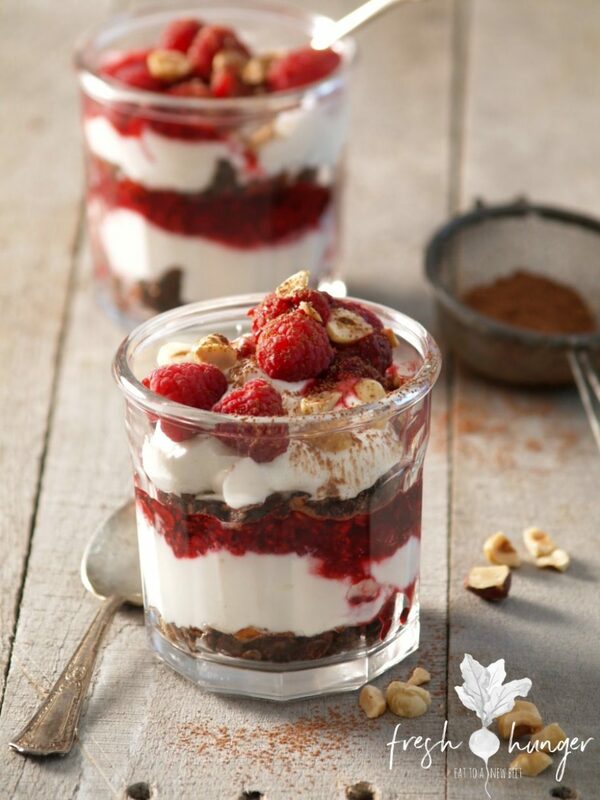 Top with fresh raspberries, reserved hazelnuts & a dusting of cacao powder. The granola makes about 24 servings. 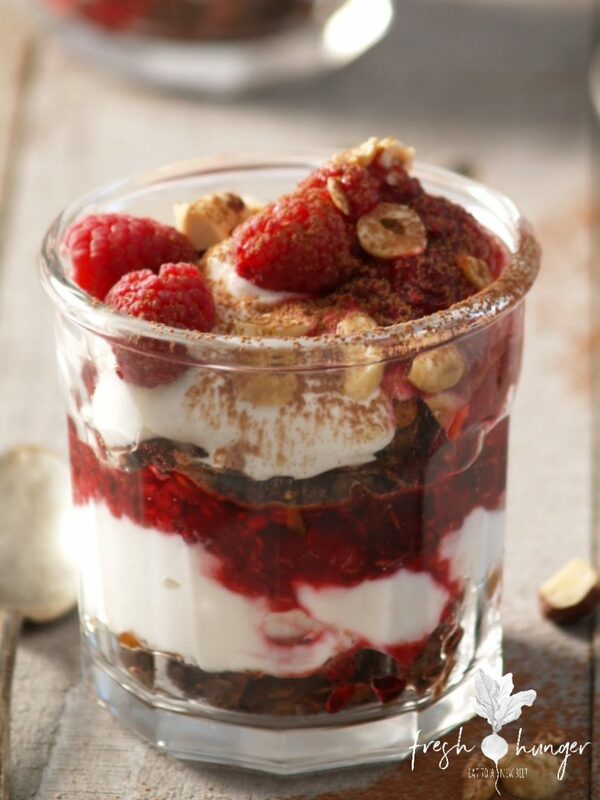 The raspberry compote makes about 4 servings. You can double or triple compote.